Of course it really isn’t as simple as a just running a newspaper ad anymore – ads and audiences don’t cut it. Here’s an interesting counterpoint: this campaign from the TVB was designed to show the power of television, but it clearly also illustrates no medium stands alone. No doubt amazing things can happen when a big idea grounded in a consumer insight & on brand is powered by a well thought out combination of paid, earned & owned media. Check out this award winner. However, there are lots of challenges at this end of spectrum: nervous advertisers who want to see proposals but are reluctant to fund them, agencies expert in some channels but not all (and not always able to partner effectively), the incredible cost in labour to project management these campaigns, the importance of the illusive big creative idea, and maybe most importantly, the uncertain outcomes – will consumers get involved and will this time and money payout? The payout is a big question. 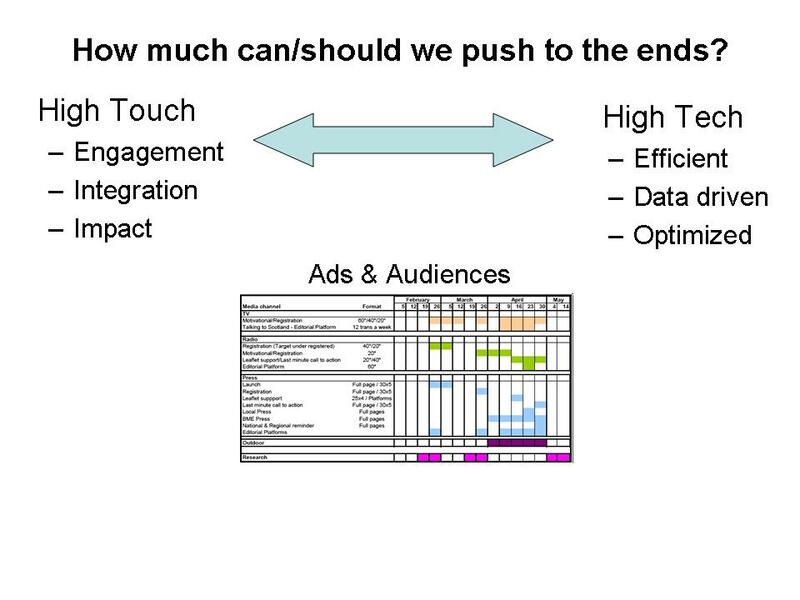 It’s a challenge to measure the effectiveness of each individual element and it’s a challenge to measure total campaign effectiveness; it’s almost impossible to measure the contribution each element made to whole. I’ll be exploring metrics at this end of the spectrum at the eMetric Marketing Optimization Summit. Look for me at the Transmedia and Multi-Channel Media Experiences session on April 29th. The high tech end of the spectrum is a hot bed of activity. Check out Terence Kawaja’s talk on this. Does this crazy world matter to anyone outside the display advertising world? I believe so. As more media goes digital, what we know about distributing, tracking and optimizating online advertising will apply to OOH, TV. 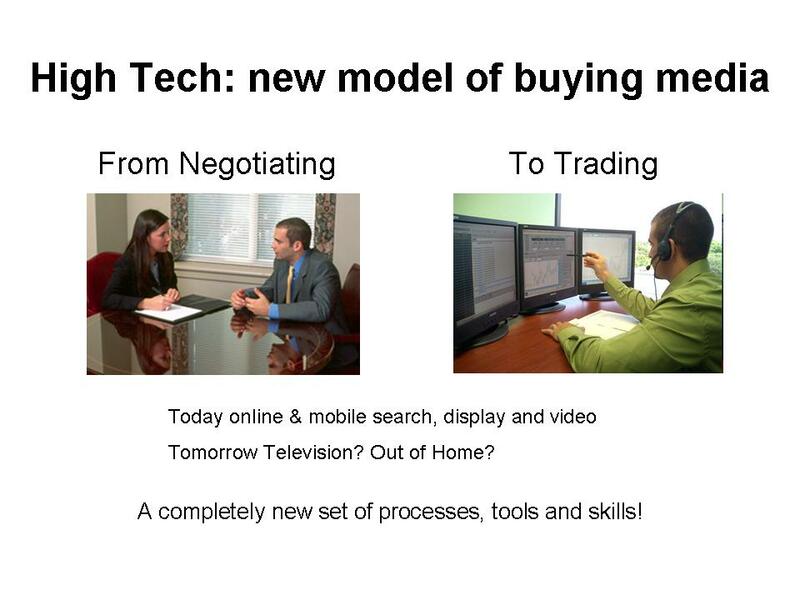 This will completely transform the media buying business. No doubt there are hurdles. The legacy systems and resources big agencies and media companies contend with make it difficult to profitably “retool” at the pace demanded – plus there’s still lots of manual labour and intellectual leadership required despite the automation you might expect. The reluctance, particularly in Canada, to invest in what is seen as a smaller piece of the media investment pie holds us back. (although this does seem to be changing with recent activity at Bell as an example). Privacy issues need to be negotiated – are we citizens or consumers? Rights of way have to be navigated between content producers, rights owners and distributers – the struggle between disintermediation (NHL.com, YouTube) and vertical integration (Rogers, Bell) will continue. Fun times!